Jamboree’s 2019 overall club show winner was Kappa Sigma Phi’s and Phi Lambda’s Scooby-Doo. The lead rolls were played by (l-r) Maddie Nekola, Mitchell Englund, Jacob Compton, Bronson Wheeler and Eliza Norton. ach year, I am continually impressed with the talented scholars we attract to Faulkner University. They come to us not only for a successful education, but also for guidance as they embark on a new journey. Our job is simple: to set them on the path that leads them to a purposeful and service-filled career that will bring glory to God. They may be going into ministry and leading a church as one of the youngest ministers in the Church of Christ, or they are looking to fulfill their dream to teach the youth the importance of life. They may have taken a leap of faith to leave their family a world away to pursue a Christian education or they may have simply found solace among our faculty and staff as they juggle being a single parent and finishing a life-long dream of becoming a teacher. These are just a few examples of the many stories our students carry with them onto our campus. We embrace them from all walks of life. They may come from different parts of the country or the world. They differ racially, socio-economically and in age, but they are all striving toward a goal. In the process, they discover Faulkner is a safe harbor where they can grow and nurture their God-given talents, so they can in turn steer their lives toward the challenges of helping a broken humanity. You can read their stories for yourself and when you do, I hope you are inspired. Most days you can find Aisha Anderson in the lab in Brooks Hall, wearing her white coat and latex gloves. She might be helping a student dial a microscope to peer into a Petri dish, directing a class’s attention to a microorganism or studying a tank of goldfish for her own capstone research project. It's all in a day's work for Anderson, a senior biochemistry major, lab assistant intern and biology and chemistry tutor at the university's Academic Center for Excellence (ACE). Doing all this while finishing her capstone research project may seem daunting, but not to Anderson. The Alabama native admitted her work load is challenging, but that’s one of the reasons she loves it so much. She thrives on chemistry and has a new-found love for biology, so the pairing of the two fields is something she wants to share with the next generation. “I always knew I wanted to teach kids, but after I took my first chemistry class, I knew I wanted to teach them science,” Anderson said. “Once I began taking biology classes, I just fell in love with the lab work.” Anderson's capstone project focuses on the possibility that a lack of essential proteins in commercial goldfish food could be a cause for the short life-span of pet goldfish. She, like many others, has felt the devastation of making sure a pet goldfish was fed and well cared for, only to have them pass away after just a few days. Anderson enjoys the work, reading articles, researching her hypothesis and setting up control and experimental groups to test her theory. It’s the kind of work that has the potential to gain the attention of national researchers. If all goes well, she will have the opportunity to present her findings to a national college conference or submit her paper to a scientific journal. In the past five years, students in Faulkner’s natural and physical science department have participated in the National Forum on Climate Change, as well as presenting research at the Annual Meeting of the Alabama Academy of Science each year. This year nearly a dozen Faulkner students presented at the conference and were invited to attend and present their research findings at the Annual Conference in Clanton, Ohio. “It’s a challenge, but reading science means gaining knowledge and that is both exciting and interesting,” Anderson said. “Since there is no chemistry track at Faulkner, I pursued biochemistry. The science department is so versatile.” The science department is designed to provide students with the fundamentals they need while enabling them to choose any number of possible interests in pre-professional fields like medicine, dentistry, ophthalmology, nutrition and pharmacy, applied fields such as teaching, animal science, agronomy, food science, natural resources management and veterinary medicine and career fields such as anthropology, archaeology, forensic science and mortuary science. “The small class size allowed me to really get to know my professors well and we created a bond and a relationship that told me they cared about my future. I know I’m well prepared for whatever lies ahead, whether that’s a teaching job or pursuing graduate school,” Anderson said. Anderson is the founding president of Faulkner’s Science Association, which morphed into the brand new Sigma Zeta National Science and Mathematics Honor Society, and now serves as secretary. As an ACE tutor, she is nationally certified by the National Tutoring Association to tutor science and mathematics. She has also worked in the Faulkner University call center and attended the March for Life event with the campus pro-life student group. Far From Home, Ian Chen Finds Solace in God, Faulkner Family “The program has been so good. I’m glad I chose this field, because the more I learn about computer science, software and development, the more areas I find that need technology,” Chen said. “It’s challenging and a lot to learn, but it’s worth it. My professors connect what we learn in the classroom to real life. They encourage me and make the classes so interesting.” Even more helpful has been learning about the business of technology and how as a programmer, he can help a company use resources wisely and save money, Chen said. “Our professors are teaching us to use real-life techniques that a programmer would use to solve problems. We learn how things are run, how real industry works and we know what to look for and pay attention to as the industry changes as more new tech comes along,” he said. Nearly 8,000 miles and an ocean separate Ian Chen from his biological family in northern China. If you ask him if he has ever felt alone in America, he says no and smiles broadly. He says the friends he found at Faulkner are his new family in Christ. It was the kindness of others and their desire to serve that first impressed Chen when he came to live in the South. People at his church and his school went out of their way to comfort and love him, he said. “I love my family in China and I see them during visits, but going back to China after living here in America, I see huge differences in how things and people operate,” Chen said. “People here care more about your spiritual life, what we can do to help others, community service. People gave up their time for me, sacrificed for me. They welcomed me into their home.” Naturally, saying goodbye to his mother and father was difficult. He felt anxious, nervous and scared, but he was assured of one thing: his faith in God. “I wasn’t sure what the future held. I was stepping into the unknown, but one thing my mom told me helped me. She said I was going to a place where they knew God. She said, ‘Where the people are that know God that is where your family will be. That will be your home.’ As Christians, we are family with one another,” Chen said. When Chen was still in high school, he made the long journey to Montgomery to finish his education at two local Christian schools and then decided to pursue higher education at Faulkner University. He is now a junior studying computer science and minoring in math. A benefit of living and learning in America has been the freedom to not only choose his own career path, but to get a liberal arts education, Chen said. “A liberal arts education not only teaches knowledge, but it gives students wisdom and guidance for what our goals should look like after graduation,” Chen said. “It showed me how to think, taught me more about the Bible, how to become a useful citizen to society and how to be a good man. When I told my parents, they were so happy.” He is looking forward to finishing his last year at Faulkner and will then search for a company to sponsor his stay in America. Chen encourages those looking at coming to Faulkner from out of state or out of the country to be courageous, try something new and ask lots of questions. He came to Faulkner a stranger looking for a brighter future. He will leave a member of the Faulkner family. “Trust in the living, true God and know that he has prepared the best for us,” Chen said. “In the end, it doesn’t matter how tough the journey may have been, how hard it may have been to leave my family, God was there and he made my path easy.” Chen is a member of the Alpha Chi Honor Society, the Faulkner Computer Club and Sigma Zeta, the National Science and Mathematics Honor Society and has been a part of the social club, Sigma Phi Chi. He attends Landmark Church, volunteers during the summer at Lincoln Village in Tennessee and sings Christmas carols at local nursing homes. Single Mom Takes Leap of Faith to Become Teacher take time and I’m excited to see what the future holds,” Harris said. Harris is studying for her Bachelor of Science in Elementary Education, while earning a spot on the President’s List and assisting in the education lab through the work-study program. It’s a full schedule of classes and work before she picks up her daughter from school. When Meghan Harris, now 30, became a single mom, she had to put her college education on hold. Moving back to Montgomery to raise her daughter in her hometown, she began a career in administration in the medical field, but she felt something was missing. Since she was a little girl playing pretend school with her dolls, Harris had a desire to teach. To follow her calling meant enrolling at a new college after seven years. In 2018, Harris’ daughter Ollie, 8, was accepted into the magnet program with Montgomery Public Schools and Harris went back to college to continue her education. Making the emotional and financial sacrifices necessary to turn her dream into a reality was one of the hardest decisions she’s made, she said. Faulkner Eagle Uses Football to Keep Youth on the Right Path Malik Washington gripped the football, fingers tightening as he readied to toss it to one of the young boys he was coaching. Then, out of the corner of his eye, he spotted one of his team on the field, hanging back. Washington had a feeling something was wrong. “When I was in high school, playing sports, I began to coach youth football and youth camps and I just liked being with kids. I wanted to help them, keep them off the streets by teaching them a love for sports.” Since coming to Montgomery to play on the offensive line for the Eagles, Washington has stayed true to his calling and will graduate in May. The criminal justice department has afforded him opportunities to visit with local probation officers and create important contacts within the law enforcement community. After graduation, Washington plans to continue coaching, enroll in the police academy and later earn a master’s degree in psychology. His eventually wants to move back home to California and work as a juvenile probation officer to make a difference for the young people of his community. Washington is a member of the Faulkner University Police Department, has volunteered at Davis Elementary with his fellow Eagles and is a member of Sigma Alpha Pi, the National Society of Leadership and Success. He most recently represented Faulkner in the HBCU Spirit of America Bowl in Salem, Virginia on January 20 along with Faulkner Eagles Kylan Cotton and Blake Levin. Eight-year-old Trevonte Peterson sat with his family in the wooden pew, singing and listening to the preacher give the message like they did every Sunday morning. For generations, Peterson’s family had attended the same little church in Greenville, Alabama, but on that particular Sunday morning, his eyes grew wide as dozens of people made their way to the front of the church to kneel and pray. It had been a powerful service, and the scene made an such an impression on Peterson, that he calls it a turning point in his life. It was the moment he discovered his calling to be a preacher. “They came forward with tears in their eyes. They were heart-felt tears and I had this feeling. I thought if I could help someone get to that point that would be an amazing thing,” Peterson said. After that pivotal service, Peterson went to his minister, asking to preach his first sermon. Instead of telling Peterson to wait until he was older, the minister took him under his wing and began teaching him the scriptures three days a week. During a Christmas service eight months later, Peterson preached his first sermon, and he’s been preaching and sharing the Gospel ever since. Now, at the age of 23, Peterson is often introduced as the youngest pulpit minister in the Church of Christ. He preaches full time at a church in Fort Walton Beach, Florida and has spoken at conferences and gospel meetings, during chapel on Faulkner’s campus and has led devotionals for fellow students. Villa received an offer to play professional baseball with the Tampa Bay Rays, but when he fell back into his old habits, he was released. “I got the chance to play professional baseball. I had money. I had everything, but I was like, ‘Why am I not happy? No matter what I do I just feel so empty.’” Villa went to Yavapai College and won a national championship. His sophomore year he came to visit Faulkner University, but received no interest from the Eagle baseball program. Back in San Diego, his friend Hosea asked him about Christ and invited him to a Bible study. When Villa got the opportunity to play summer baseball in the U.S. he went, hoping to escape his surroundings and change his ways, but the reputation he had made for himself followed him to San Diego. Soon after he started attending Bible study, he and his friend prayed about his situation. The next day, Villa received a call from Mike Mendoza, assistant baseball coach at Faulkner. Judge Jones’s son, a Montgomery County circuit judge for many years, began holding law classes in the county courthouse in 1924, and he officially established the law school in 1928, naming it after his father. Leading Montgomery attorneys and judges taught the classes, which quickly moved out of the courthouse and into a series of locations. Eventually, the law school found a home in a building on Hull Street, right behind the Jones home on Adams Avenue. After the death of its founder in 1963, the law school passed through a series of owners. Faulkner University purchased it in 1983 and, in 1996, constructed a new building for it that was expanded in 2001 and again in 2011. The law school obtained provisional approval from the American Bar Association in 2006, followed by full approval in 2009, making Jones the third ABAaccredited law school in Alabama. After 90 years, Jones has more than 2,500 alumni, many of whom have risen to the top of the Alabama bench and bar. Four graduates have served on the Supreme Court of Alabama, and three more have served on the state courts of appeals. Nearly 40 Jones graduates have served as state and federal trial judges; nine currently serve as district attorneys. Hundreds of Jones alumni are employed in public service. Many more are in private practice at some of the best firms in the state. Students at Jones come from a variety of backgrounds. They engage in substantial public service while in law school through the elder law, family violence, and mediation clinics, as well as other pro bono service opportunities and student organizations. In fact, the school’s legal clinics recently won the Gold Medallion award from the Montgomery County Bar Foundation Volunteer Lawyers Program for the third year in a row. The law school has built a national reputation in trial advocacy. The most recent U.S. News rankings rated the trial advocacy program 15th in the nation. The faculty continue to build solid reputations for scholarship, teaching, and service, and regularly participate in academic conferences and publish in top law reviews. Over the past two years, the law school has significantly improved the entering qualifications of its incoming students, with the current first-year class having some of the best undergraduate grades in the law school’s history. Celebrate, celebrate, come on and celebrate! The crowd erupted as alumni hosts and hostesses joined students on stage to sing and clap along to classic songs reflecting love, friends and family. There was truly a reason to get up on your feet and celebrate at this year’s Jamboree Celebrate 40! anniversary event. Students and alumni came together to perform hit songs from the movies The Greatest Showman and Trolls, and other classics from throughout the decades. For 40 years, the student body has come together to fill campus with song, story, laughter and most importantly, lasting relationships. Between the antics of a talking robot, a Great Dane, DC’s finest, a rabbit and a stuttering pig, the crowd was left roaring with laughter as club shows took us down memory lane and embodied beloved characters from our favorite Saturday morning cartoons of the 1970s. The show’s overall winners, Kappa Sigma Phi and Phi Lambda, transported us back to a simpler, happier time of Scooby snacks and Shaggy’s jokes as Scooby-Doo and the gang once again unmasked the villain behind a mysterious jewel theft. Sigma Psi Chi and Chi Omicron Chi taught us the importance of a family’s love as The Jetsons, a normal family who happen to use flying cars and talking robots, search to find their metallic maid, Rosie, and bring her back into their family. Finding love, friendship and family was a recurring theme throughout the club shows, and struck a personal chord for many of the 40 alumni who returned to perform as a host or hostess or entertain the audience with their own club show. Four decades worth of friendships and marriages have found their beginnings with Jamboree. When Casey Crawford, one of this year’s alumni hosts, reminisced about his time at Faulkner, he spoke about two things: how he met his wife Jillann (Wallace) Crawford during freshman year and his rap solo to an Eminem song during Jamboree. He claims to still hold the record for being the only student to do that. Jokes aside, he said his most memorable moments were shared with his future wife and the friends he made through his social club, Epsilon Phi Upsilon, Jamboree and singing with Cornerstone, the retired university sponsored acapella quartet. “My favorite things about Faulkner were the relationships. It was so great to hear about this anniversary show and to be invited back to sing. This time, my wife and I will sing on stage as a married couple, which is really exciting,” Crawford said. They drove up from Pensacola, Florida, where Crawford serves as a youth minister at Scenic Hills Church of Christ, to perform the Cyndi Lauper song “True Colors,” which was recently revitalized by Justin Timberlake and Anna Kendrick for the animated movie Trolls. In addition to host and hostesses, more than 30 alumni came back to perform in their own club show packed with famous superheroes like Superman, Batman and Robin, Wonder Woman, Aquaman and guest appearances by the Joker and Green Lantern. Coordinated by Michelle Otwell, their show was based on the Saturday morning cartoon, Superfriends and the good guys battled supervillains, Lex Luthor, Cheetah and the Legion of Doom. Alumni (l-r) Neil Scott, John Gordon, Jamall King, and Andrew Itson play superheroes who are past their prime in the alumni show. Faulkner students (l-r) Hannah Temple, Kristen Roberts, Wes McGeehee, Ashley Tucker, and Jaycy Nail represent the villains in Kappa Sigma Phi’s and Phi Lambda’s winning Jamboree 2019 show, Scooby Doo. Jamboree host and hostesses (l-r) Lauri Ann Itson, Jon Podein, Jason Isbell, and Honey Wilson sing “From Now on” from the movie, The Greatest Showman. For Kasarjian, Jamboree was a way to represent her school and have fun. Now as a director, she pushes and encourages each student in the club shows and those she trains as hosts and hostesses to be the best that they can be. For this year’s performance, she knew she wanted to bring back as many former hosts and hostesses and club show performers as she could to celebrate the past and look forward to the future. Having them come back and perform was truly magical, she said. “The biggest thing for me was that the people I invited back, really wanted to come back,” Kasarjian said. “I come from a family that bleeds performance. While other families rallied around sports, we wanted to be on stage. 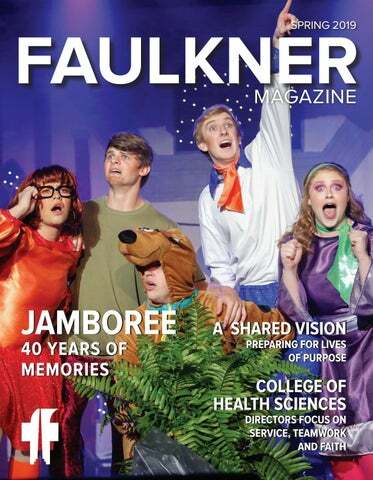 So to have a group of people that loves music and singing and Faulkner as much as I do, it was really exciting to see everything come together.” “Faulkner, and especially Jamboree, holds so many good memories for me. It’s really special to be back and be part of the show again. I didn’t really know how much I missed it after all these years,” Baldwin said. Alumna (l-r) Savannah Dockins, Brittany (Morris) VanZandt and Haley (Itson) Scott play Wonder Woman and her Amazon warriors in the Jamboree alumni club show, Superfriends. Faulkner University students (l-r) Danielle O’Dell, Michelle Davis, Marista Otwell, Melody Coe, Andrew Russell, Matthew Tuck, Brkela Miller, Peyton Osborne, Lauren Colasacco, Vernon Chisholm play The Jetsons for Sigma Psi Chi’s and Chi Omicron Chi’s Jamboree club show. New College of Health Sciences Directors Focus on Service, Teamwork & Faith The team at Faulkner University’s College of Health Sciences is steadily expanding. The university has hired directors to develop the next three programs; the physician assistant (PA) program is scheduled to begin in 2020, physical therapy (PT) in 2021 and occupational therapy (OT) in 2022, pending accreditation. Amy Oliver, director of the occupational therapy program is the most recent hire. Oliver earned her occupational therapy degree from The University of Mississippi Medical Center and her doctoral degree in occupational therapy from Rocky Amy Oliver Mountain University of Health Professions in Utah. She has been in clinic work and pediatrics for the last 26 years. Before coming to Faulkner, she served as an occupational therapist at the Ouachita Parish School District in West Monroe, Louisiana and at the University of Louisiana. “This interdisciplinary education is a reflection on how rehab staff work together in clinics and hospitals,” she said. “The future of health science careers is moving toward team based health care and collaboration. This is the unique educational environment we are offering our students at Faulkner,” said Heather Mount, director of the physical therapy program. Mount, originally from Wisconsin, moved to Andalusia, Alabama after PT school. She worked as a PT in rural Alabama for 14 years and taught for seven years in the PT program at Alabama State University. “Health care providers can have a tremendous impact in their communities and beyond. By helping others, we are doing God’s work,” said Mount. Oliver first stumbled upon OT in high school when she was observing a physical therapy group for a class. She noticed another group and was drawn to them because they were laughing and seemed to be having a good time. Doing God’s work is exactly what sealed the deal for Paul Jordan, director of the PA program. “They were batting balloons to each other using their arms, which were affected by strokes or other neurological conditions,” said Oliver. Jordan was practicing in Southern California at the time he received the offer to organize the new PA program at Faulkner. “I learned that OT is a way to help people function again, to live their lives as independently as possible.” Oliver was looking for an OT program where service to others was paramount. “When I found Faulkner, I knew this was from God,” Oliver said. “It was my desire to teach the next generation about occupational therapy in a way that serves the community, the patient, the family members and especially children with autism.” Oliver especially liked the plan to have OT, PT, speech and language pathology and PA working collaboratively in one building, learning to work together as a team. Williams, a senior Bible major, said, “A simple act of love can change someone’s life forever. We are called to be Christ-like and, in order to be Christ-like, we need to love. I pray my peers were inspired to spread the love of Christ across campus.” Olivia McDaniel, a junior music education major, spoke on the different ways students can restore faith on campus. Walcott Retires After 28 Years Michael Walcott is retiring after 28 years of teaching at Faulkner. Walcott began teaching at Faulkner in the fall of 1991. He has taught a variety of subjects related to business ranging from managerial finance to microeconomics. Seniors Olivia Hatcher and Thad Williams both spoke about restoring love. difficult subjects to his personal stories and experiences. Technical Steering Group run by TechMGM. Walcott moved to New York, and then to Tuskegee where he graduated from the Tuskegee Institute. In the Fall Semester of 1991 he started teaching at Faulkner. The administration originally hired him under a one year contract, which they proceeded to renew every year for the next 27 years. TechMGM is a collaboration of local industry, educational and government entities working together to connect and leverage Montgomery’s unique technology related assets for a successful future in the digital age. Faulkner’s computer science department wants to help create that future. With a hands-on approach and a strong emphasis on the fundamentals of programming and software, the computer science department not only prepares students to be valuable assets in the industry, they also understand the importance of giving back and serving their community. Hammond will be working directly with the steering group to expose students to new tech opportunities and growth in Montgomery, she said. “This will enable Faulkner University to connect with industry and government in the city of Montgomery, which will provide opportunities for collaboration and internships for our students,” Hammond said. TechMGM’s goal is to maximize the community’s technology and promote the city as an emerging and innovative tech hub to enhance the workforce and grow the area’s economy. Montgomery is already investing in important partnerships between industry, the local community, the U.S. Air Force and Department of Defense in order to create an area that attracts such growth. The Montgomery Area Chamber of Commerce announced Faulkner University’s Jones School of Law as the inaugural 2018 MGM Impact Maker in the Midsize Business Category. The announcement of the 2018 Impact Makers was made at the Montgomery Chamber’s 146th Annual Meeting on December 11. The Impact Makers campaign was a way for the Montgomery Chamber to honor and recognize member businesses within the community who are making an impact. More than 50 nominations were made and over 70,000 votes were cast to determine the category winners. program, is president of Delta Xi Omega, vice-president of the Collegiate Entrepreneur Organization, a Davis Elementary mentor, a member of Sigma Beta Delta International Business Society and Alpha Chi Honor Society and an intern at the Montgomery Regional Airport. Sargent will graduate in May with a BA degree in biology. He is a member of Kappa Sigma Phi, serving as vice-president this year. He works at Mike’s Merchandise and the Multiplex and attends University Church of Christ. Jonathan Sargent and Hannah Walker were named 2019 Mr. and Miss Faulkner University. Phi Alpha Theta History Honor Society Initiation This March, Faulkner witnessed the resurgence of its Phi Alpha Theta National History Honor Society chapter with the induction of eight eligible students. Barrett Hutto, Cara Lambert, Tracy Clark, James Whitmire, Elijah Weems, Hope Sheehy, Jeremiah Short and Reagan Amos, who was in Italy at the time, were inducted into Phi Alpha Theta during a ceremony in the Perry Dining Room. “Being initiated into Phi Alpha Theta is a very prestigious honor and one you will have for a lifetime,” said Jason Jewell, PhD., chair of the humanities department. “Our chapter of Phi Alpha Theta went inactive so we are very excited we have so many students eligible and willing to participate.” Alumnus and Alabama House Representative Will Dismukes addressed the students. Jeff Arrington helps a Davis Elementary student with her project. Faulkner students, faculty and staff from natural and physical sciences, computer science, math and education participated in STEM Day at Davis Elementary. The Davis Elementary students had a chance to build bridges out of marshmallows, build a strong supported structure out of heart candies, measure the weight of their favorite snacks and decrypt secret messages as a part of the school’s inaugural STEM Day. Each activity provided a fun, hands on approach to lessons in science, technology, engineering and mathematics. Norton Receives Churchwell Award Eliza Norton was the inaugural recipient of the Mark S. Churchwell Entrepreneurship Award, a competitive award created as a way to honor Mark Churchwell, a long-time faculty member of the Harris College of Business, who died unexpectedly in May of 2017. Taylor Strength works with Davis Elementary students. Andres de Torres and Kinsey Fickling are crowned as Faulkner Universityâ&#x20AC;&#x2122;s Homecoming King and Queen. Study Abroad program participants Gerren Wasden, Calli Hunton, Hayley Sargent, Tucker Presley, Katie Flanagan, Angell Williams, and Jordyn Wasden pause for a selfie at Pisa. Angela Grant, a freshman from Hoover, Alabama earned First Team honors and was named Freshman of the Year at the SSAC awards banquet in February. “I am so excited that the coaches in the conference chose Angela for first team All Conference. She is a dominant player on both ends of the floor. She is a great teammate and a fierce competitor,” Faulkner Head Coach Reed Sutton said of the star freshman. “This season had a really strong group of Freshmen in our conference, and even within our team. It is a privilege to have Angela recognized as the most accomplished in that group. She put up very impressive numbers this season, especially when you consider how she has come back from a concussion and breaking her hand without missing a beat. We are blessed to have her as a Lady Eagle for three more years.” Grant averaged 12.4 points and 9.5 rebounds per game this season while starting in 21 contests for the Lady Eagles. In addition to Grant’s honors, the Eagles and Lady Eagles garnered many additional honors. Leading scorer Ashlyn Adkins made First Team after averaging 12.6 points per game while also averaging 3.7 rebounds, one block and one steal per contest. Milan Skundric took First Team All-Conference honors after a season in which he averaged 16 points, 8.4 rebounds, 2.1 assists, 1.43 blocks and 1.23 steals per game. Rene Scott finished Second Team All-Conference after averaging 15.6 points per game for the Eagles. Sean Edwards, Adnan Haliovic, Morgan Sykes, Dyani Thompson and Kayla Key made the All-Academic Teams. Sykes and Edwards also received recognition as a part of the Musco Lighting Champions of Character Team. With hands clasped on the table before her and a fond smile on her lips, Burt talked about her time at Faulkner. Although she knew it as Alabama Christian College before its name change in 1985, the feelings she has toward the institution remain the same. “I love Faulkner because I went to school there. I love the people I met and knew there.” Burt highlights her father as a great influence on her family’s faith, saying, “When he became a Christian, he became a Christian.” He wanted his whole family to understand the importance behind a relationship with God. In 1951 when he heard about Alabama Christian opening a first-grade program, he moved his family from Ramer to Montgomery, so his children could have a Christian education. Burt’s parents, “Momma and Poppa Burt” as many of her classmates fondly knew them, were staples in the Alabama Christian community. It was not rare to find a large group of children down the dirt-road at the family’s apartment for Kool-aid, fudge and popcorn. Momma Burt taught kindergarten for years, four of which took place in the family’s own home. All three of the Burt children attended the school and Poppa Burt took special care to ensure the success of such an amazing place. late, the dorm advisors always knew where to find their missing tenants, hanging out with the Burts. Freshman initiation was a tradition on Alabama Christian College’s campus and Burt was no exception. She laughs, remembering the silly tasks she and her friends had to perform. Whether it was sporting a silly outfit or helping a sophomore carry their things, Olivia and her friends always enjoyed their duties. This fun-filled exciting time flew by and in just two short years, Olivia recalls being on her way to the “real world.” Burt moved away for a short time but found herself back in Montgomery soon enough. She went back to school twice in her adult life but has always seen Faulkner as the foundation for her education. She says her education at Faulkner led her to a wonderful life full of excitement, adventure and life-long learning. Burt’s Christian education also led her to a life of servanthood. She has been on many mission trips including seven to Thailand. Her tour of Israel is one that she says everyone should have the opportunity to do. She has been involved in the Lads to Leaders program on both the national and local level. She is always quick to volunteer in her congregation at University Church of Christ, particularly with the Hispanic outreach program. As an active member of University Church of Christ, Burt feels a strong connection with the school that has given her so much. She finds ways each day to help the current students of Faulkner University. “When they have yard sales, I donate things. When they have lectures, I attend them.” Sometimes being a great alumna is not about giving great amounts of money and time. Rather, it’s repeatedly doing the small things which add up to the biggest impact. Scott Gafford (‘95) teaches PE, coaches basketball and serves as the athletic director at Fleeta Junior High in Opp, Alabama. His wife, Heather (Andrews, ‘92) Gafford teaches 4th grade at Opp Elementary. Danny Barnett ('96) is the new vice president of human resources with the Alabama State Port Authority. 1990’s Ernie Longino ('90 & ‘18) and his wife, Kimberly Longino (‘90) have been married for 25 years. Ernie received his MBA from Faulkner in May 2018. They have two children, Andrew, 14, and Kaitlyn, 12. Patrick M. Tuten (‘91 & '95) was appointed to serve as District Court Judge in the 23rd Judicial Circuit of Alabama (Madison County) by Governor Kay Ivey on January 18, 2019. Kyle D. Massengale (‘93) and his wife Jamie Massengale (‘92) will celebrate their 30th wedding anniversary this August. Kyle is the evangelism minister at Madison Church of Christ in Madison, Alabama He also runs a small private law practice mostly doing pro bono work for churches and elder law. Jamie teaches Kindergarten at Columbia Elementary in Madison. 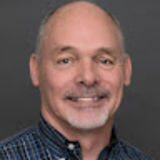 Paul A Clark (‘94) is the president/CEO of Merrick Medical Center in Central City, Nebraska, since December, 2018. Clark served as interim president/ CEO since August. Daryl Holley (‘94) is the owner of recently opened F-O-R-T-U-N-E Personnel Consultants (FPC) franchise in Ocean Springs, Mississippi. FPC is a nationwide executive search firm. Lyle Harmon (‘95) was named the new St. Clair County district attorney by Alabama Gov. Kay Ivey in January. Melody (Parrish, ‘87) White is a new business partner with her sister, Heather S. Parrish (‘98), at Southern Art and Makers Collective (formerly Product of Montgomery) on Madison Avenue in Montgomery. The shop features the work of artists and craftspeople from the Southeastern United States. 2000’s Brandy (Hunt, ‘00) Ludwick is the new laboratory technician in the natural and physical science department at Faulkner University. Roger Williams (‘01) is the new assistant softball coach and lead JV softball coach at Briarwood Christian School in Birmingham, Alabama. Misty Fortner (‘03) was promoted to accounting manager for Koch Foods at the Ashland, Alabama branch in April 2018. David Muns (‘04) is the new chief operating officer overseeing hospital operations and clinical departments at Merit Health Wesley in Hattiesburg, Mississippi. Robyn Cope (‘07) and her husband James celebrated their 10th wedding anniversary on October 2018. Jeremy Smith ('07) is the new director of sports information and marketing at Faulkner. West and Carrie (Butler, ‘08) Cherry and 3-yearold son Mason welcomed the newest addition to their family, Logan, born in January 2019. Carrie is a neonatal nurse at UAB. Do you or someone you know have news to be included in the next edition of the alumni magazine? Send updates and photos to Robin “Bird” Bradford, rbradford@faulkner.edu. 2010’s Sean Thom ('10) is the new head football coach at Lassiter High School in Cobb County, Georgia. Kasey (Porter, ‘11) Clayton graduated with a Master in Early Childhood Special Education from UAB in August 2017 and currently works as a Pre-K teacher at Leeds Primary School in Leeds, Alabama. Lerin Roberts (‘11) was hired as a special education teacher and the volleyball and softball coach at North Crowley High School in Fort Worth, Texas in August 2016. Thomas Dorminy (‘13) signed to the Somerset Patriots. He was the 2018 Frontier League Pitcher of the Year, and was named both mid-season and post-season all-star. Demetris Bernard and Jami-Leigh (Fanning, ‘13) Hill and were married on November 11, 2017. Kayla Elizabeth Farnon ('13) married Mason Bradford Bass on November 17, 2018. Brent and Brittany (Harden, ‘13) Todd celebrated nine years of marriage on April 10, 2019. They have a 6-year-old daughter, Aubree Jean. Brittany is a PE teacher and volleyball coach at Calera High School in Alabama. She received her master’s in physical education from the University of South Florida in May 2015. Diandre and Autumn Brooke (Pulliam, ‘13) Hensley and were married on August 5, 2017. Austin Wade ('15) and Rachel McGuire Fuller were married August 24, 2018. Saul Calderon-Zavala (‘16) and Bethany Hunter recently moved to Tennessee, where Saul began working as a substance abuse counselor for Buffalo Valley Inc. Men’s Facility and Bethany began working as a security technician for Buffalo Valley Inc. Women’s Facility. Augusta Guthrie ('16) is teaching at Westbury Christian School in Houston, Texas. Jared Nicholas Palmer (‘16) and Vashti Rampersad ('16) were married on April 6, 2019. Aaron Reynolds ('16) works as a full time extra with a casting company in Atlanta. He recently got some on screen time as a pedestrian on the street in the Hallmark movie Christmas Everlasting. Reynolds has been an extra in several movies and TV shows, including Tyler Perry's Nobody's Fool, The Walking Dead, and Stranger Things. Corporal R.J. Carter (‘17) graduated from the Montgomery Police Academy on February 26, 2019. He now serves as a certified police officer in Alabama and continues to work for the Faulkner Police Department. Gabriel (‘17) and Brittany (‘17) Queiroz were married on May 13, 2017. Gabriel was hired as the assistant coach for the Faulkner Men’s Soccer team. Brittany received her certification as a therapeutic riding instructor from PATH International in Thomasville, Georgia. in December 2018 and teaches lessons at Montgomery Area Nontraditional Equestrians (MANE). She is pursuing her Masters in Applied Behavior Analysis through the Chicago School of Professional Psychology. Hayden (‘18) and Hallie Dean were married December 15, 2018. Emily Donovan (‘18) and Trever Manley were married on April 13, 2019. Jordan Kinlaw (‘18) was hired as the new 5th grade math and science teacher at Ringgold Elementary in Clarksville, Tennessee on August 1, 2018. Michaela (Pettway, ‘18) McMeans is the contact representative for Executive and Professional Enrollment at Faulkner University. Dylan Motes (‘18) was sworn into the US Army as an officer candidate on March 8, 2019. Christine Norvell (‘14) teaches at Regent Preparatory School of Oklahoma, and is an author. Her topic for the conference is On Teaching Tragedy in Tragic Times. David Head (‘18) teaches English composition at Seffner Christian Academy near Tampa, Florida. He will speak on Dante as a Role Model of the Classical Christian Humanist. Sean Hadley, a current Ph.D. student, teaches humanities at Trintas Christian School in Ferry Pass, Florida. His topic is Growing Up with Jack: How Learning from C. S. Lewis Spans the Grammar, Logic, & Rhetoric Schools. In Memory Rebecca Kay Potter (‘18) started a new job as the band director at McEwen High School in McEwen, Tennessee on January 7, 2019. Christian Smith (‘18) is an intern for Robins & Morton in Raleigh, North Carolina working on a project that is building a new patient tower for Duke Raleigh Hospital, which will house over 100 patients. Marisa Sutton ('18) is an admissions clerk at Faulkner. Blaine and Auburn (Terry, ‘18) Chason were married January 19th, 2019. Auburn is an admissions counselor at Faulkner. William Tidwell (‘18) started a new job as a junior staff member at Moses and Moses, P.A. in February. Great Books Honors Alumni to Present at Colloquium Great Books Honors students are making their mark in the world of classical Christian education. Of the four presenters at the Colloquium on Teaching Literature in a Classical Christian School on June 12, 2019, two are alumni and one is a current student in the graduate program. Jon Hazelip, 79, died March 4, 2019. Coach Hazelip was part of Alabama Christian College from 1973–1981. In addition to coaching the Eagles Basketball teams, he served as a physical education instructor and athletic director for seven years. Under Hazelip’s direction, the 1980-1981 team became the first ACC team to go to a National Tournament and brought home a third place trophy. Because of the national recognition, March 30, 1981 was proclaimed Jon Hazelip Day in the city of Montgomery by Mayor Emory Folmar. Hazelip was also named Coach of the Year for the Deep South District of the NLCAA. Hazelip was inducted into the Faulkner University Hall of Fame in 2014. Hazelip was married to Carolyn (Weaver) for 60 years. They have four children; Teri, Ricky, Barbie & Tommy. Remembering Harrison Harrison McGaughy, son of Caleb (‘17) and Maggie (Mobley, ‘16) McGaughy, died October 26, 2018, 30 minutes after his birth. Harrison was 21 inches long, and weighed 8 lbs. 14 oz. Successful business owner, Jason Akins became a faithful supporter of Faulkner University after hearing about the university from a friend. The more he and his wife Stacie learned about the school and began interacting with people associated with the university, the more he wanted to support the school and its Christian mission. “When I began to meet people from Faulkner and attend some of the events, I was impressed,” Akins said. “Everyone was organized and they went about their business professionally and they definitely put religion and their faith as a priority which meant a lot to me.” Akins is the proud owner of Akins Furniture, in Fort Payne, Alabama, a company that has been in his family for generations and has grown over the years. When he heard Faulkner was in need of furniture for several new student areas on campus, he jumped at the opportunity to help and donated several dozen large pieces of furniture and décor to the cause.